Here you can create a new view of different types. Each view is created in an own separate tab, with a name and icon depending on its type. Each view type has its own characteristic set of inline buttons at the top (explained with their respective ribbons). The greyed out types will be implemented in future versions. Close the currently selected tab by clicking on the right Close symbol [ x ]. Change the tab name after double-clicking on it. Change the tab order by drag&dropping tabs. Tabs can be dragged out of the main window as separate windows and docked into it again afterwards, but not all functionality is available for such separated tabs. These are three ways to enhance a spectra view. The multicursor gives a collective vertical readout for all spectra at a movable x position. 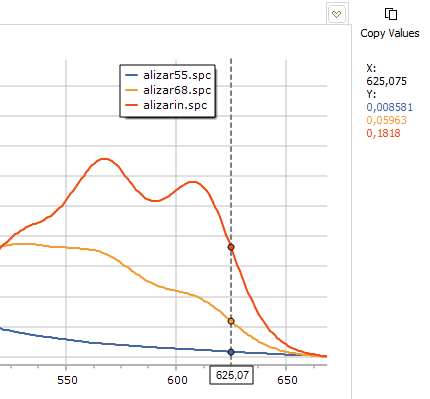 The additional peak labeling toolbar has many options for automated labeling of peak maxima. The spectroscope view bar show the spectral as if the measured sample was viewed through a visual spectroscope. The multicursor tool gives a collective vertical readout for all spectra at one movable x position. With the upper "Copy Values" button, the values are copied to the clipboard for further use. Another click onto the "Multicursor" button will remove both the vertical line as well as the right-hand value display area. - label type: a label can consist of both a peaks x and y value, or only one of them. - threshold: to rule out labeling of noise-related maxima from the lower part of the spectrum, a lower limit for detecting peaks is set (default: 5% of Max-Min). - prominence: a principle borrowed from geography. A prominence of 10 will show only the most prominent peak of all, lower prominence values show more of the little peaks. Turn it off by choosing prominence=0. - digits (x, y): define the number of relevant digits for the displayed values. - angle: use 90° for showing vertical labels, 0° for horizontal ones, and any values inbetween for inclined labels. 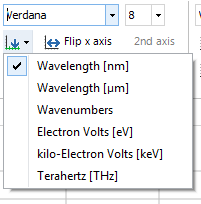 - spectra selection: either select a single spectrum in the drop down menu or label all spectra together. - With the function, you can vertically stack up to 15 spectra at once. Each one then has it's own y axis. Zooming, panning and scrolling happens simultaneously for all of them, but please use the topmost spectrum for this. - The button allows to show/hide the grid lines, which are located behind the spectra traces. The Color button let's you select any color as plot background. It is only visible on screen, but not within printouts or exported plot images. This area has some options for influencing the display of spectral traces. 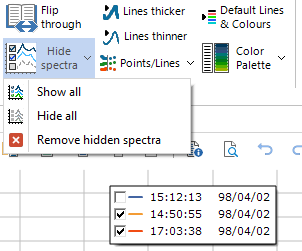 You can temporarily hide from display a selection of spectra without removing them. 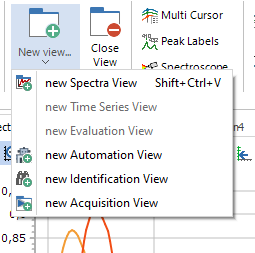 Line width is variable, data values can be shown as points, color sequence for consecutive spectra is changeable and after playing around, a default display can be set again. On clicking the spectra hiding button, a checkbox is shown next to each legend entry in the legend box . Uncheck a legend entry for hiding the corresponding spectrum. Check it for showing again. After clicking the "Hide spectra" button a second time, the legend box is shown normal, but without the unchecked spectra and legend entries. - "Show all" checks all legend entries at once, leading to the full plot again. To be used before hiding only a few spectra. - "Hide all" unchecks all legend entries at once, leading to an empty plot. To be used before showing only a few spectra. - After a decision to not only hide but actually remove the hidden spectra, just click the "Remove hidden spectra" menu point. For changing the global line width of all spectra together. Clicking one of the buttons once changes the line width by one step. There are 9 steps available, per default the second or third step is active. When changing a single spectrum's line width in the "Spectra" ribbon, this happens relative to the global line width from here. Before printing and creating image files, a line width around three is recommended. Sometimes, the data point marks might be hard to see, depending on line width, x axis step width and zoom status. Here you can choose from 16 different color palettes to give distinguished colors to your spectra plot. Each palette was optimized for viewing and printing (no white, yellow, light grey color entries). Use the "Preview" button for getting a glimpse on how your spectra will look like with another palette. 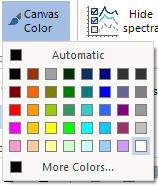 Press the "Apply" button to activate the selected palette. The selected palette is also used as standard palette with the "Standard Lines & Colors" function. 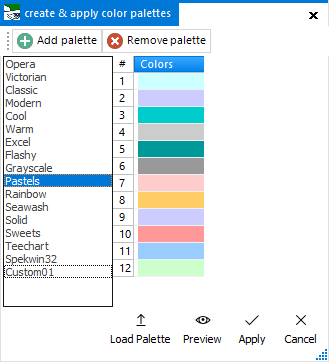 In a future software version, there will be ways to create color gradient palettes, as well as completely user-defined color palettes. 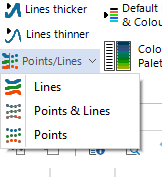 Whichever weird combinations of line color, line type, points&lines and global/ individual line width you chose, this button will set it back to standard values. That is: colors from the standard color palette, solid lines, no points, line width of two. However, all those weird combinations can be preserved for eternity by saving as Spectragryph *.sgd binary file. At least, this works for line type, width and color. - Use the upper dropdown menus to set font type and font size for the axis titles and axis tick marks. Use the lower right down arrow for full font control. 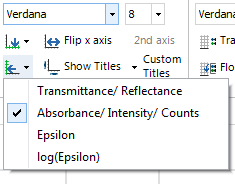 - Switch the x axis direction with "Flip axis". - Activate the display of your custom titles (set by clicking onto the axis titles) with the "Custom Titles" button. - Hide one or both axis titles from display with the "Show Titles" button. - Select your desired x and y axis type for display from these two buttons ("Change x axis" and "Change y axis"). Any spectrum can be displayed with every axis type, as long it makes sense physically and is possible mathematically. - IMPORTANT HINT: The calculations are done on the fly and do not affect the spectral data as such, only the visual display is changed! - Use the upper dropdown menus to set font type and font size for the legend entries. Use the lower right down arrow for full font control. - The "Floating" button switches the legend display between fixed + outside the plot and floating + inside the plot. -With the upper dropdown menu, choose from a wide range of historic app styles. Office 2013/ 2016 are most recommended. The app styles named after older Office versions required some changes layout, leading to a reduced feature set in the "File" menu. Sorry for this. - The effect of choosing color for the app style is not available for all of them. It is strongest for "Office 2016 White". - With "Old style menu", a nearly classical pure menu is shown, you can get back by clicking onto "Switch back modern style"